In our journey from a barren desert to a prosperous developed nation, Sheikh #Zayed was always there to guide us and lead our way. With his departure we lost part of our souls, part of our hearts and we were overwhelmed with grief. Didn’t he know, when he passed away, that his nation still needed him? Is he resting in peace knowing that his mission and tasks are accomplished? Maybe for the first time he did not take into consideration how much we loved him, how much we would miss him and how difficult it would be for us, the generation of #Zayed and Rashid (the late ruler of Dubai), to move forward without him? Oh, #Zayed! How could we elegise you when you have taught us to be against that? Should we mourn for you when you have taught us that men’s tears are very precious and should not be shed, and that a person should be content to accept the will of God? Please realise that our grief is endless; that men may weep when the deceased is the one behind their unity and renaissance. You departed content that you had accomplished your mission. The united country has a strong base now. Our consolation is that your successor, Khalifa, and all his brothers will carry on with the march till the end and that the leadership now is in wise and responsible hands. Now that you have departed I would like to say what I couldn’t say in your overwhelming presence, thinking that I might offend your original down-to-earth Arab attitude. I want to talk about the great achievements that you always regarded as your mere national duty. But for us, we were proud to have a leader who enlightened the whole Arab and Islamic World. Let me talk about your major achievements. During your lifetime you accomplished the unification of the Seven Emirates, built on sacrifice and consensus. The United Arab Emirates is the first real Arab unity, and we pray to God that it is not the last one. And when you departed, you realised the unified grief of the Arab people who mourned you from the mountains of Lebanon to the plains of Palestine, to the streets of Cairo. You were remembered in all cities of the Islamic World, where you have extended a helping hand in their time of need. It is, hard to talk about #Zayed. Hard because he is no longer with us and because of the great and comprehensive achievements which formed the life and legacy of #Zayed. Therefore, I’ll talk about his role in establishing the #UAE, his Arab role and his international and Islamic role. Sheikh #Zayed had been aware of the concerns of his homeland since his early days and was disturbed by the artificial ’borders’ that separated the people. So he set his sights on realising the unification of the country, hand-in-hand with Sheikh Rashid. After that, he faced the challenges of the vast barren desert that imposed difficulties on the people. He managed to transform the desert into a green oasis, turn poverty into wealth and formulate a unified personality of Emirate citizens, stressing always the necessity of respecting both the people and the country. #Zayed was extremely generous. He never expected to get anything back for what he gave. He shared the wealth of Abu Dhabi with everyone, whether they were related or not. With his vision and innate intelligence, he knew that it was essential to diversify the national revenue. For him, economic security was as important as national security. Hence, he worked hard to create new revenues, in addition to oil, in order to maintain the high social and economic standards of the #UAE people. #Zayed believed that a rich society should serve a man, not the other way around. He dedicated the wealth of the nation to maintaining domestic peace, and endeavoured also to make universal peace. Since his youth, #Zayed believed in unity - the unity of the family, the tribe, the people and the nation. He worked hard to achieve the unification of the #UAE as a first step towards a greater Arab unity. He did not wait for the borders to fall, but moved headlong to support the perseverance of the people of Palestine and constantly provided for their survival. He helped to ease the suffering of the Lebanese people and did not forget to build new communities for the poor in Cairo. He did not forget Sudan or any other Arab country. He always took the initiative to save those in need without them having to asking. He did not wait for gratitude, because he believed that one should be grateful to God alone. He always supported Arab rights and was ready to help bridge the gaps in the Arab World. Hence, the #UAE was the first Arab state to resume relations with Egypt after they were severed due to the Camp David agreement, in order to keep close relations with the Egyptian people, and because he believed that Egypt must play a lead role in achieving strategic and political balance in the region. He offered the only initiative before the last war in Iraq when he asked Saddam to step down in order to protect the Iraqi people. His nationalist feelings were so profound and they were shown in his deeds, not only in words. He announced in 1973 that Arab oil is not more precious that Arab blood, and followed that statement by imposing an embargo on oil exports to countries that supported the Israeli occupation of Arab land. #Zayed always supported rightful Islamic causes; at any time and any place. Therefore his support was not limited to an area or a continent. #Zayed always called for civilized dialogue between Islam and other religions. Palestine mourned him despite its worry over Arafat. He was also mourned by Lebanon, Egypt, Syria, Sudan, the North African countries, the Asian and European countries, the Gulf states and every other country that benefited from #Zayed’s generosity. It is no secret that the #UAE has always been at the fore in extending moral and material support to Islamic issues all over the world. I would even say that he did not hesitate to support any human cause, regardless of the religious and political balance in the region. #Zayed’s march continues. 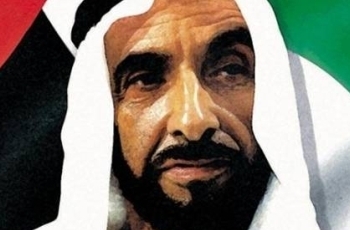 His successor was raised in the shadow of #Zayed’s achievements. Our country is in the capable hands of good leaders that were educated by a great man, who was not only a ruler, but a father, a leader and a guide. Oh #Zayed, we cannot say good-bye. You live in our memories, and we will remember you with every breeze, every dawn, every dusk, and with the birth of every hope. And to your successor Khalifa, we repeat our vow of allegiance to stand behind you, may the Lord guide you to lead the nation. You are now subscribed. Invalid Email Address. Ignore Trump’s bigotry at your peril! Khalaf Ahmad Al Habtoor Publications This is the official website for UAE businessman Khalaf Ahmad Al Habtoor. You will find candid articles written by the outspoken entrepreneur and philanthropist on topics that matter most to the region. Al Habtoor voices his hopes and concerns for key issues impacting the world – including realistic solutions for a peaceful co-existence in some of the most troubled regions. He also provides sound advice to world leaders to help make the world a better place.